The Westfield Service League (WSL) was founded in 1932 (and incorporated in 1953) with 19 women whose goal it was to meet the urgent needs of many Westfield residents suffering from the effects of the Depression. Working with the local District Nursing Association (DNA), these women elected Esther Nichols as President and became involved in knitting sweaters, delivering holiday baskets and assisting in the Motor Corps. In 1933, the DNA asked the Service League to take over management of its Thrift Shop. Additionally, the WSL ran a lunchroom at the YMCA for 100 undernourished school children, collected pennies for the Milk Fund and began a long association with The Children’s Country Home, now known as Children’s Specialized Hospital. Currently, we are a group of over 182 women volunteers: 78 active/ senior active members, 26 associate members, and 78 sustainer members. We are passionate about raising money to support deserving non-profits in our community. View a list of our presidents. 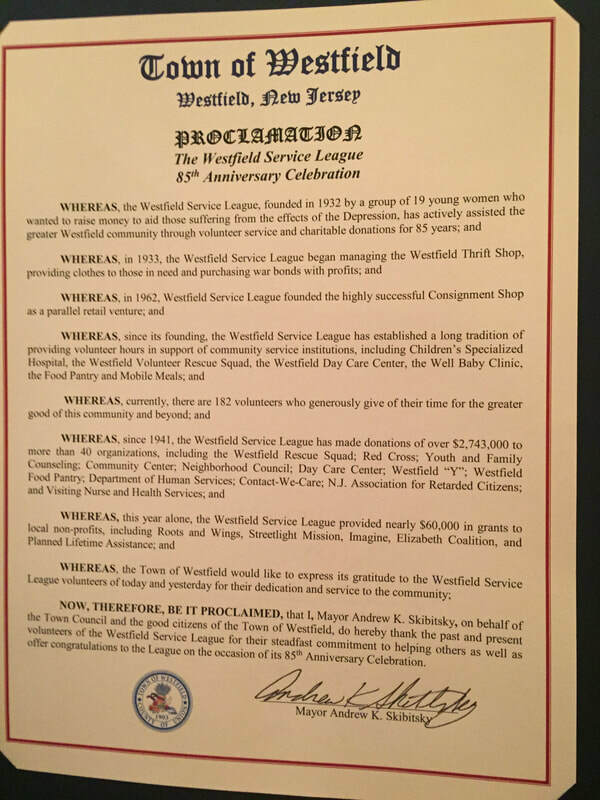 In 2017, The Westfield Service League was recognized with a proclamation by the Town of Westfield for its 85 years of service to Westfield. League President Kim Taylor and other board members were presented with the proclamation at at Town Council meeting in 2017. The proclamation appears below.